The large pile of Cold Wax Medium on the left in the image, can easily be coloured with the small glob of oil paint on the right! The amount of oil paint that is added to the Cold Wax Painting Medium is a matter of personal choice. Determined by the painting or application and how it is applied. Spend a little time mixing the Cold Wax Painting Medium and Oil paint to find what consistency and feel you prefer. A closer look at the Cold Wax Painting Medium with a small amount of Oil paint added. The texture of both wax and oil is clear to see. 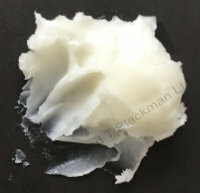 The wax has modified the oil, not only by volume but it is more translucent, with plenty of 'body'. It's a good practice to move some wax from the initial pile. 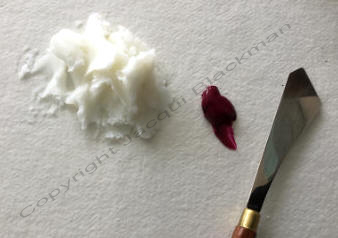 Then only add a small 'pea sized' blob of oil with the tip of a palette knife. Mix the two together and note the way it mixes and the effect you achieve, adjust accordingly. 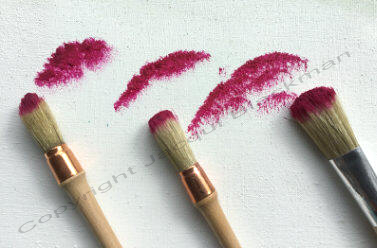 Round Pointed, Flat and Domed Sash Brushes The consistency showing in the above image would be good to use with bristle brushes for stippling the paint onto a surface. Stippling has been used for hundreds of years for adding paint to a surface, the marks, textures and patterns are easy to achieve with practice and are very expressive. 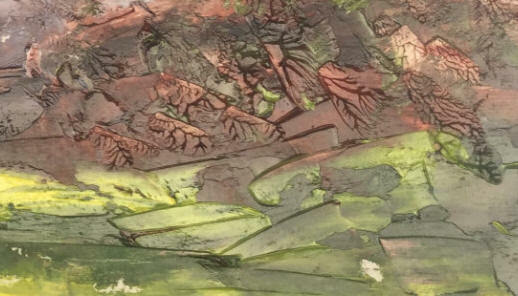 Examples of some available marks from three different brushes are shown left, because the wax is mixed with the oil paint the surface is very textured and upraised. Try these marks with different round and flat brushes. Pale blue wax/oil was brushed onto the untreated birch ply, dark paint was knifed on starting thicker on the left. Other colours were also knifed onto the surface. Tools like those shown as Clay Tools and Colour Shapers were used to inscribe the surface of the wax. Some were fast gestured movements, others sharp and angular, others slow squiggles. The veneer of the birch ply showed through, this could be further coloured with thinned wax/oil or a glaze. Lines inscribed into the wax/oil. Painting knives have it! 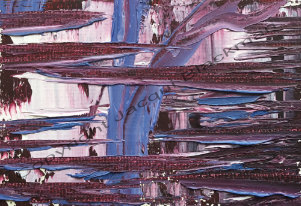 This is a close-up from the painting 'Spume'. Spume means to create or form a mass of froth or foam. This was accomplished with a painting knife. The paper was coloured or 'under painted' with thinned oil mixture which was first brushed onto the surface. 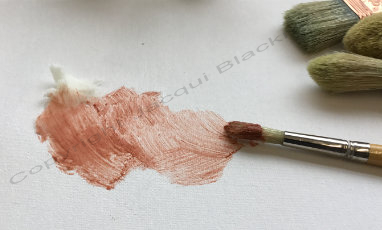 A painting knife was then used throughout to apply and mix wax/oil of various tones ending with the almost white mixture, which shows bright against the dark under colour. The effect of the water foam was achieved by, in effect, stippling with the knife. 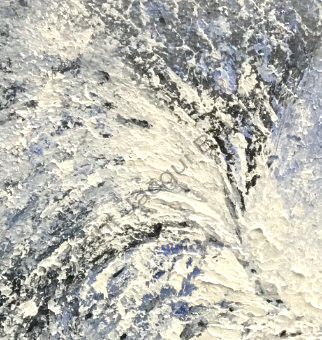 The knife, just like with the brush leaves behind a pattern, often quite random, which gave the moving, 'flying foam' effect. In this example the wax/oil mixture was applied using a painting knife and a thin 'skim' applied to cover the surface of the canvas. The 'tree like' mark made in the middle, going north-south, was applied using a brush. Needs a delicate touch. The lines travelling east-west were made with a blunt blade used to 'plough' the wax/oil without taking it from the surface of the canvas. The bottom edges have a ribbon of mixture curled over and raised from the surface. Round angled Fitch brush Here a small amount of transparent oil paint has been mixed into the Cold Wax Painting Medium using a small Fitch brush, these are Decorators brushes. The hair in a Fitch brush is not as tightly packed as an artists Hog for instance, making it easier to move and apply the thick mixture. Also called a 'cutting in' brush, or nooks and crannies brush! 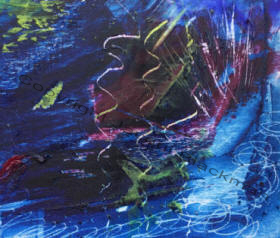 The direction of the brush strokes can be used to form patterns and texture on the surface when applying the wax. 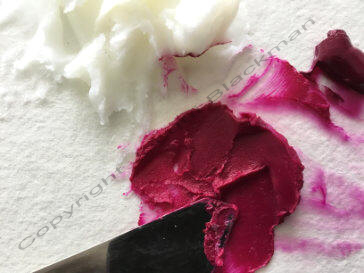 Next time you have some leftover wax/oil paint, take a painting knife that you don't know very well, use it to mix and apply the paint to a surface, even to a palette, if that's all that's available. Its quite interesting the different marks and patterns that you find, just by playing with the mixture. "Learn to play and you'll play to learn", we did it as children so we do know how!